Great news everyone! Earlier this month we launched Perfect Pour, our second product. We're delighted to share the announcement with you all. 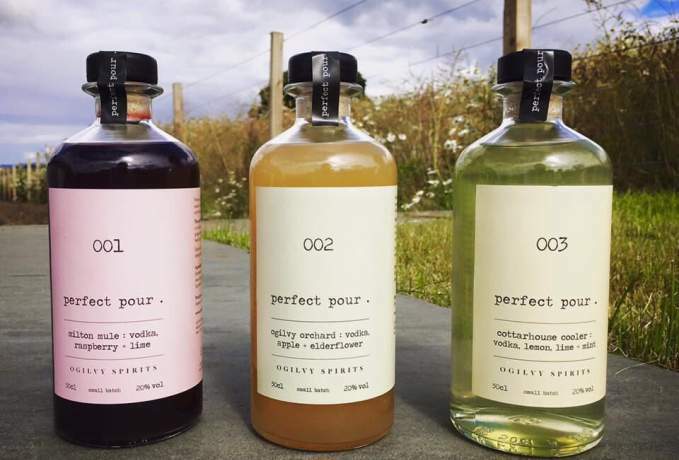 Perfect Pour is a brand new range of vodka-based cocktail mixes which can be blended with tonic, lemonade, ginger beer or Prosecco to create the perfect homemade cocktail. We've used a blend of refreshing fresh fruit juices and herbs, to give a natural sweet taste. Perfect Pour is a follow-up to our signature potato vodka which was launched in January 2015. - 003 Cottarhouse Cooler, a mix Ogilvy Potato Vodka, lemon, lime and mint. Perfect Pour is priced at £20.00 and is bottled at 20% ABV at our farm in Angus, a stone’s throw from where the potatoes are planted, grown and harvested. After two years of hard work it’s great to be able to launch our second product. There is a huge appetite out there for cocktails which you can create yourself and the idea for Perfect Pour came about as a direct result of this. We know consumers are much more focused on provenance and quality of the craft spirits they drink than ever before. They want to know and trust where their food and drink comes from. We launched Perfect Pour at Foodies Festival in Edinburgh this month and it's already stocked in a number of farm shops and premium drinks retailers across the UK. The ingredients used to create Perfect Pour are sourced by us and we have tried to work closely with local suppliers as much as possible as well as looking further afield. The raspberries and elderflower are grown and pressed locally here in Angus. The raspberries are actually grown in nearby walled gardens, not polytunnels, which gives them a fantastic natural flavor and colour. The great reaction we have had for our cocktails at the various shows we have attended has shown people that they can create excellent quality cocktails at home.